As you can probably tell, it’s the things from my youth that had the greatest impact on me. From sartorial inspiration, my father was a Brooks Brothers Preppy, to 70’s surf style—David Nuuhiwa at Huntington, to the cars that the local heroes drove—why I have a soft spot for 70’s VW square backs—Aviation High School’s board transporter of choice. It’s what the crazed watch collectors call “grail” things. Those Holy Grail items that haunt them; the must haves, the quest. I have a theory that passion for collecting moves in 25-45 year cycles, we love the things that inspired us, but were unattainable in our youth i.e., in 1972, Bahne skateboards were $29.85 when the Super Surfers were $12.95. And, Cadillac skateboard wheels were $4.95/each—and, hard to come by, while the standard composite wheels were a buck or less. 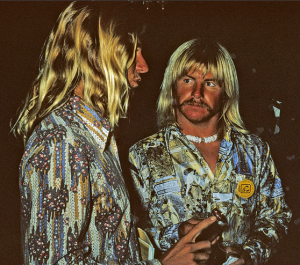 Hermosa surf star, Mike Purpus, drove a 1978 Black Porsche Turbo, which seemed completely exotic to all of us. That’s Mike with the Puka shells in a Jeff Devine photo. As this all pertains to cars, and me. I became obsessed with the last of the handmade Mercedes and BMW’s. 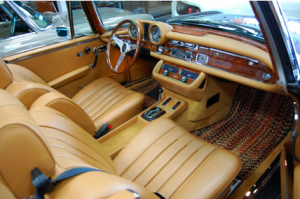 As a kid, a friend’s mom drove a 1970’s Mercedes 280sel 3.5 sedan, and even then we were all moved by the beauty of the burl wood dash, and the physics of the Becker Europa radio—it wasn’t a stereo. The 2002 BMW’s were small, sharp, and cool. In college, the hipsters from Marin County kept the ski racks on year round, always ready for the trip to Tahoe. I was in a 1975 2002 last night, and the indescribable smell of the interior, brought me right back there. 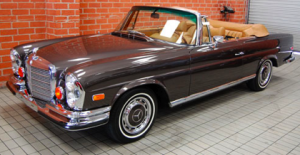 But, I remember the moment in Santa Barbara when I fell in love with the low-grilled 1970 Mercedes 280se convertible. I was in junior high, but in Santa Barbara with the family. I became car obsessed as a 12 year old, and my dad’s passion for all things motorized, cars and Cushman scooters, had me thinking about driving every day from 11 until I turned 16. This particular 280se was parked in front of the Santa Barbara Biltmore, and embodied all that was old school and wonderful about Montecito. It was silver, with a navy top and interior, the owner was a rakish mid-30’s prepster with a hot GF. I was in love, not with the girl, but with the 280se. Last month I had the opportunity to trade my 20-year project, a 1948 Mercury Woodie, (click for video) for one of the nicest 1970 280se’s that I have ever seen. 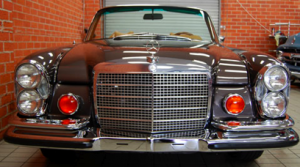 Restored by Malibu/Calabasas legend, Scott Melnick–Auto Engineering/Classic Mercedes, it came to me through my dear friend Andy Cohen at Beverly Hills Classic Cars. I never thought I’d sell the Woodie, but the siren song of nostalgia, in the form of the 280, was too much for me to withstand. The car came from a great collection, with only a couple of thousand miles since the full restoration. In the last two weeks, I’ve driven it more than I drove the Woodie in the last 4 years. This era of Mercedes is truly the last of the breed. Build quality that everyone wishes Mercedes still delivered, a super heavy and solid ride, and little touches like seat backs that won’t fold forward when the engines running—for safety, activated by a vacuum switch. I took my daughters for their first ride in the car last week; I hadn’t realized that they had never been in a convertible before. As we jammed down Vista Del Mar, sun blazing, wind in our faces, my beaming daughter Daisy said she “felt like she was flying…” I know exactly what she meant.